That allows us to "hit the mark" with seminar attendees, and establish instant credibility and relevance for both the trainer and the content. That's important because the more that participants see the material as relevant to their own experiences, the more they will learn during the seminar, and continue to learn, post-seminar. For more features, click here. Because we custom design and tailor our Dealing WIth Difficult Customer Seminar, we can offer a sometimes dizzying array of options, so we'll summarize in terms of length, content, and course configuration. Our seminars are available to suit the time slots you have available. We understand that it can be a challenge arranging for time away from work, and that the longer the seminar, the more difficult it can become. That's particularly the case when you might wish to offer training to all staff in a work unit, and can't close down the unit for training. In the past we've offered seminars of one half day, a full day, a day and half and even two complete days, in addition to being available to do much shorter speaking engagements on dealing with angry citizens. Our half day option is the most practical since it more easily fits into work schedules. 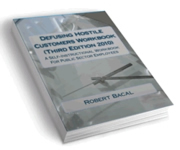 The drawback is that a half day is not long enough to cover all of the techniques we teach, and that appear in our Defusing Hostile Customers Workbook For The Public Sector. It also makes it difficult to provide adequate interactions that one would want to enhance learning. The half day option has evolved, and is now coupled with providing a copy of the Defusing Hostile Customers Workbook to each attendee. In this configuration, we cover basic principles and a number of defusing, anti-escalation tactics in class, but we also focus on and encourage learners to continue to learn by using the workbook. By offering a full day of training, we can cover most of the material and tactics, and allow enough discussion and learning activities to make the seminar more enjoyable and useful once back at the job. Again, though, we suggest that all participants receive their own copy of the workbook to use as a reference, and so they might continue to enhance their skills. It's been some time since we've offered a two day option for the seminar. Obviously it allows a more intensive experience, but our sense is that two days is simply too long, and fatigue sets in. For this reason, if you are considering a longer seminar, you might want to talk to us about a day and a half. As indicated on our pricing page, we negotiate a fee on a individual basis. We do our best to not let price get in the way of offering this essential training to your staff, and also to set things up for the best possible learning experience. That said, any differences between the various lengths of seminar are minimal. That way price doesn't become a factor in choosing the best option with you. We can offer our seminar to your staff in a flexible manner to suit your workplace requirements. For example, in the past we've offered the full day seminar in two half day "chunks" on consecutive days. Ideal for situations where you need to keep your office open, since this is one way to allow all staff to learn the defusing skills by having half of them attend per offering. Recently, we've also had a client who wanted their occasional staff to attend, so we scheduled sessions in the evening and on weekends. Not a problem. So, really, it's up to you, as to what works best. As indicated earlier, we believe that the needs assessments we do with attendees allow us to spend more time on skills and tactics that fit their needs. We modify both the content and learning process in line with what we get back from attendees. So, for example, if no attendees deal with customers on the phone, we spend much less time discussing telephone techniques. If many go out in the field (i.e. food inspectors, farm inspectors), then we spend more time on tactics that fit the "out of the office" employee. Since we customize everything, we require some lead time, so let's get started. Email us at robertbacal@customerservicegov.com so we can set up a phone call to discuss how we can bring this seminar to your staff.